All posts in "Support Team"
In this November, 2017 update on the ministry we cover support team developments, content plans and some helpful insights and concepts shared from the planned “Missing Manual” workbook. For example, how we as believers need to use the same strategy Victor Frankl used for surviving a Holocaust concentration camp. [I’m only releasing this information to supporters:] Since learning in 2001 that Yeshua must return in a Sabbath year, I’ve had to rule out three consecutive Sabbath year cycle windows for the final 7 years (2003-2009, 2010-2016, 2017-2023). This same insight enabled me to easily rule out every date-setting prophecy theory along the way, bringing comfort to many scared readers. With the next possible window for the 70th week coming next decade (2024-2030), I’m ready to share why I believe, based on the real end time sign of Mt 24:14, that this can be the one. If it is, the nasty birth pains (WW3 + Wormwood) would start near its middle in 2026 and Yeshua would return at its end in 2030. Why am I now sharing a “doomsday year” myself and how am I not a “hypocrite” for doing so? How is my 2026 conviction different from what prophecy theory date setters have done? What about “no man knows the day or hour”? 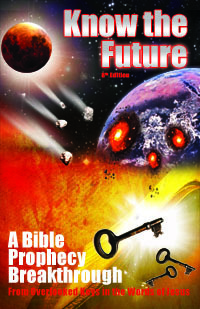 Read on to understand what has changed, why I’m so convinced about 2026 and, most importantly, what the Bible says to do if the end is indeed coming in your lifetime. Christians assume that they “follow Christ,” yet if pressed, each must admit that they simply do not understand much of Christ’s teachings needed to follow him. This includes the Sermon on the Mount, Jesus’ manifesto for the masses that Martin Luther considered impossibly demanding. Find out why Christianity does not teach it, why it is so offensive (on purpose), and how Jesus is like Mr. Miyagi from The Karate Kid—only harsher. With the three insights below, you can finally understand and obey the teaching of Jesus to no longer refer to him as “my Lord” without making him lord.